referring to my old Blogpost, where I described the Integration of the Conditional Access in System Center 2012 Configuration Manager for Exchange Online (Link) and because there was an Update with the Intune Extension to support the On-Premise Exchange Server aswell, I decided to create a new blogpost about this. The Supported Exchange Versions are currently 2010 and 2013, be sure suing one of them with a current Update Rollup (afaik for 2013 UR6 is required). A few weeks ago I changed a lot within my LAB: I divided the Clients from the Servers into separate VLANs to have a more accurate Lab. Hi, here’s Martin with a tiny Powershell One-Liner to measure, how many collection are in System Center 2012 Configuration Manager configured with the “Use incremental updates for this collection” option. 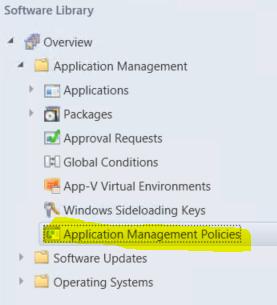 Hey, here is Martin serving you with some new Information about the MAM (Mobile Application Management) Features in the SCCM 2012 R2 SP1 Release.